Claudio Bravo is already Manchester City’s first-choice goalkeeper, of that there is no doubt. And according to the man himself, it was the promise of a weekly start that motivated his switch from the Camp Nou to the Etihad Stadium this summer. “It was not me that was [first-choice] at Barca, it was Ter Stegen. I was very sincere, I did not want to sit on the bench. It’s not my thing. And they understood. 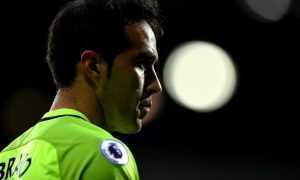 Bravo endured a difficult debut for City, spilling a high ball that led to United’s goal that put them back in the Manchester derby. Despite that, his footwork and passing were crucial in City’s build-up play and he has since kept two clean sheets in back to back 4-0 victories for the Blues. The 33-year-old has averaged 43 passes in his two starts for City, with a 78.4% accuracy – numbers that resemble those of an outfield player more than a typical Premier League goalkeeper. For Pep Guardiola, a goalkeeper with a high level of technical ability is crucial to his style, which led to the contentious decision to drop and ultimately loan out fan favourite Joe Hart recently.